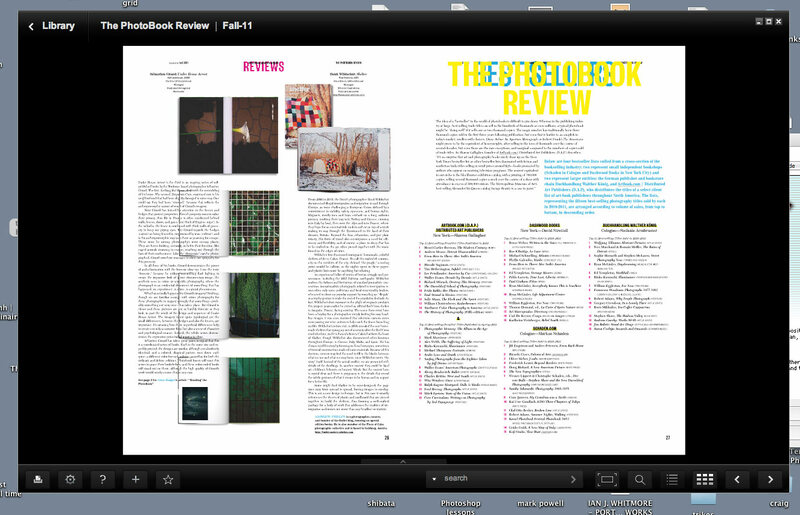 Aperture's Photobook Review is great. Definitely a welcome contributor to the photobook world. But... a journal celebrating real-world books distributed mainly in electronic version? Am I the only one who considers that ironic? Yesterday I found myself downloading yet another computer application, installing it, and entering personal info into little boxes before I could get a good look at the thing. After it opened on my desktop the interface was cumbersome. The type is very small so I had to enlarge beyond the window to read it, then use scroll bars to move my eye around the page. Not a very pleasant experience. I can't recall any real-world books giving me similar difficulties. Here I am reading along as Gossage and Meeks and Soth discuss the inadequacies of viewing something on an iPad...and I'm doing it on a computer screen. Something's wrong with this picture. I realize there's a real newsprint version. I think it's available in New York or Paris or somewhere. Would it be too much trouble to distribute it to locations where Aperture is sold? Or maybe mail it to subscribers? This isn't meant to reflect on the material. The actual substance of the thing is fantastic. The writing is thoughtful and the design is beautiful. But we're talking about books here, right. Real objects that you can hold in your hands, objects that'll be found in the stacks of a used bookstore in 20 years. 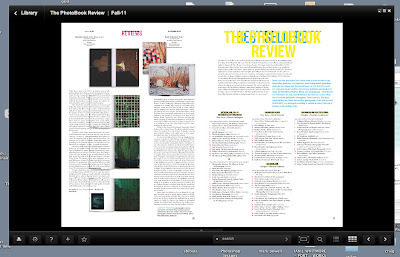 I want to handle Photobook Review and have its ink run off on my fingers. I want to smell it. Somebody should tell these Aperture people that the internets have what are called "web pages". These embody a truly amazing and high-tech idea: the page actually changes shape in order to fit the amount of space given it. No sideways scrolling! Bigger letters are just a couple of keystrokes away! No form-filling required! And if you really must have an illegible design, then yes, "web pages" let you do headers in yellow on white. Once you'd managed to scroll across this thing and decipher it, did it turn out to have interesting stuff about printed photographs that your legions of B Dittoheads might not already have heard of, or is it mostly the same group of people praising the paper, margins, binding, endpapers, "tactility", aroma etc of their buddies' books? The design is pretty intricate. I don't think it could be shown easily in HTML, although a PDF would probably work. As I said in the post I found the material great. I love lists, interviews, and books, and this has plenty of each. Sorry for the grouchy comments on likely content, but the recent Photo-Eye jamboree adds to my impression that much of photobook criticism is bibliophilia plus mutual backscratching. I'll try to look at this thing. It's cheap enough. If I understand correctly, I first have to install Adobe Air software, and then install Zinio software.... Uh, maybe next year. I'm sorry, lets not be PC here: This is exactly right: "same group of people praising the paper, margins, binding, endpapers, "tactility", aroma etc of their buddies' books"
Backscratching, tactility, aroma... I think these could all fit under the "Reptilian Wants" category. To me photobooks tend to smell better with age. All books do.